Demographics change. Technology evolves. Interest rates fluctuate. So what is the financial services industry doing to navigate these developments? The nimblest of companies that comprise “financial services” – banks, credit unions, alternative lenders, online startups, brokerages, financial advisors, etc. – are powering their websites, digital campaigns and consumer outreach with content marketing. The public needs real-time financial information, swears by customer data security and seeks advice on all things finance. 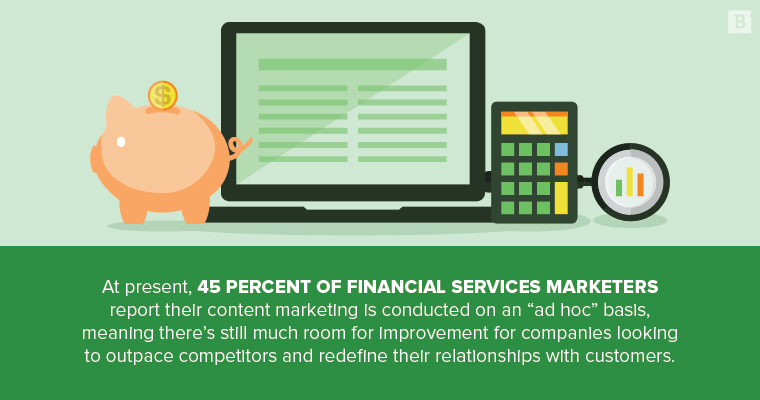 Financial content marketing is striving to meet this demand. At present, 45 percent of financial services marketers report their content marketing is conducted on an “ad hoc” basis, meaning there’s still much room for improvement for companies looking to outpace competitors and redefine their relationships with customers. Let’s walk through five examples of financial content marketing done right. What can you learn from these brands? Interactive content is a growing marketing specialty. It’s new, it’s engaging and it’s often more helpful than a static image or block of text. 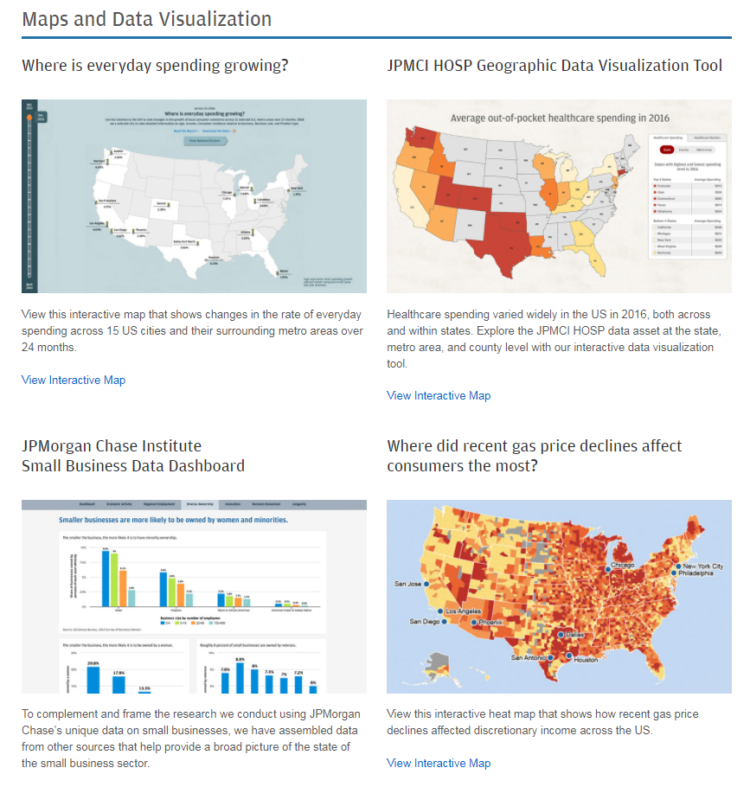 JPMorgan Chase & Co highlights these facts with their web page devoted to Data Visualization, which features a series of interactive maps, infographics and short, Did-You-Know blurbs that reveal more info when hovered over. The topics they cover are exactly what the average consumer or even the industry researcher would want to know. 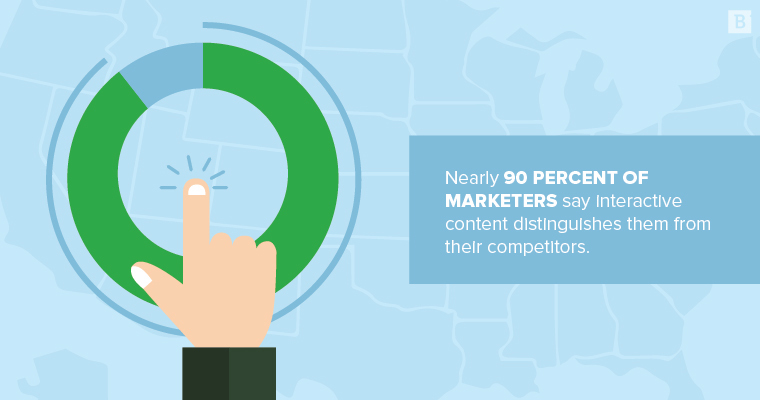 Nearly 90 percent of marketers say interactive content distinguishes them from their competitors. In the financial services world, differentiation can mean everything, as many consumers select their financial institutions based on location, convenience or existing family relationship. But interactive content allows banks that may not fit into the above categories to break the mold, offering something that’s truly unique. Attention spans are shrinking, and visuals are the perfect medium through which to maximize the brief seconds websites have to establish a connection between company and consumer. Interactive content requires a form of higher engagement from a site visitor, such that it goes beyond simply scrolling or scanning – visitors must participate in a digital exchange (i.e., hovering over an icon, clicking through an animated chart, rotating a 3-D map) to receive the information they seek. JPMorgan Chase & Co illustrates the benefit of dynamic media and why it should be a cornerstone of every organization’s content marketing. Interested in knowing the latest technology driving finance innovation? Looking for proprietary research from one of the largest investment firms in the world? What about podcasts featuring commentary from top financial executives? Morgan Stanley houses all of these and more. This information is generally geared toward a savvier investor or finance enthusiast. Churning out a similar asset (a blog, for example) on a familiar topic over and over creates a narrow impression of a brand. Employees, analysts and entrepreneurs in the financial space want more than just the ordinary tips on how to save or how to invest. They like content that is tangentially related to their field and that may spark curiosity into a subject they previously may not have had experience in. Morgan Stanley’s tangential approach to content keeps their Ideas page fresh, insightful and authentic. Plus, visitors can consume content visually or orally, meaning each day a new post is uploaded brings the opportunity for a new content experience – one that isn’t immediately expected. Because Morgan Stanley already wields industry authority on these topics, it’s a good bet for them to diversify their content to capitalize on similarly related ideas. The blog may be viewed as the most elementary content marketing asset, but its importance cannot be overstated. NerdWallet distills often-dense areas of financial interest into dedicated blog posts that any user can grasp. 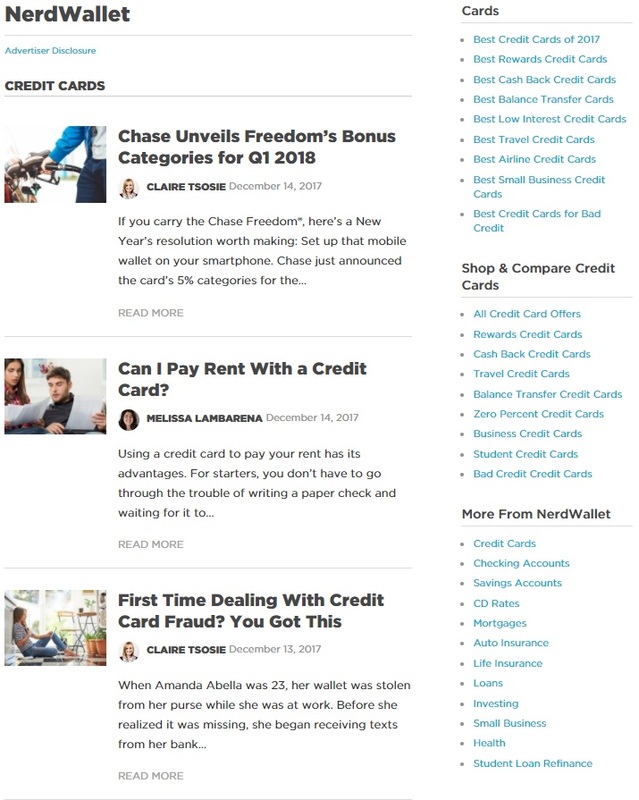 And with an exhaustive index of blogs spanning best practices for credit cards, investing, banking, loans, insurance, mortgages and money management, suffice it to say, they’re covering ideas the average consumer (e.g., millennials) wants to learn more about. 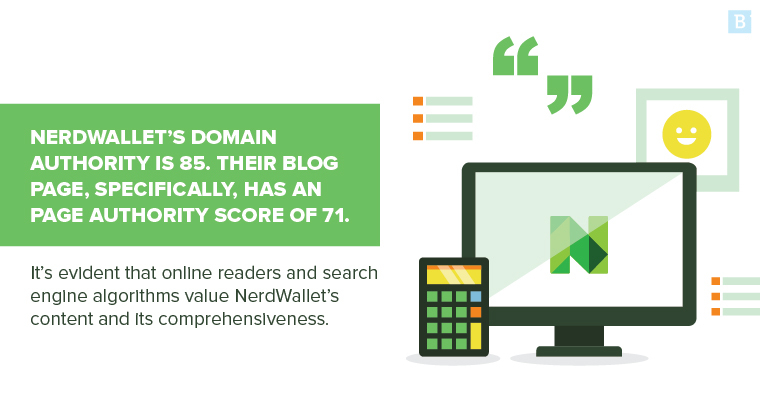 NerdWallet’s Domain Authority is 85. Their blog page, specifically, has an Page Authority score of 71. It’s evident that online readers and search engine algorithms value NerdWallet’s content and its comprehensiveness. With plenty of listicles, well-crafted headlines and approachable imagery, the millennial crowd is the obvious target audience here, and NerdWallet’s writing style says as much as well. The blog page also does a great job of linking to expanded articles of interest after each section, in addition to providing a calculator or simulator at the bottom of articles, encouraging user engagement. NerdWallet may not be the go-to expert for niche finance questions, but they know their audience, the questions that audience wants answered and the intent behind their queries, all of which are hallmarks of any great content marketing program. SoFi brands itself as a “modern finance company,” and as a digital-only operation, they are a use case in 2018 financial content marketing. Without brick-and-mortar locations, SoFi relies solely on its online applications, digital efficiencies and innovative underwriting to avoid the mistakes of traditional financial institutions and cater to the needs of today’s consumer. Their Resource Center is loaded with various calculators which tabulate and project important financial estimates, such as how long it will take to pay off a mortgage, which student loan plan is most cost-effective and IRA contribution limits based on tax-filing status. Math is hard. SoFi does it for you. That’s a valuable differentiator that other financial services may not provide as a free, user-friendly tool. Better yet, SoFi calculators are native to the page, so, as information is entered, the calculator immediately gets to work computing and projecting numbers, rather than forcing users to click multiple “enter” buttons or navigate to separate web pages. Calculators are a top-tier interactive asset that site visitors are already familiar with (aka they don’t need to be taught how to engage with the tool), which makes it more simplistic than other interactive content types like, say, maps or custom features that may come with a learning curve. 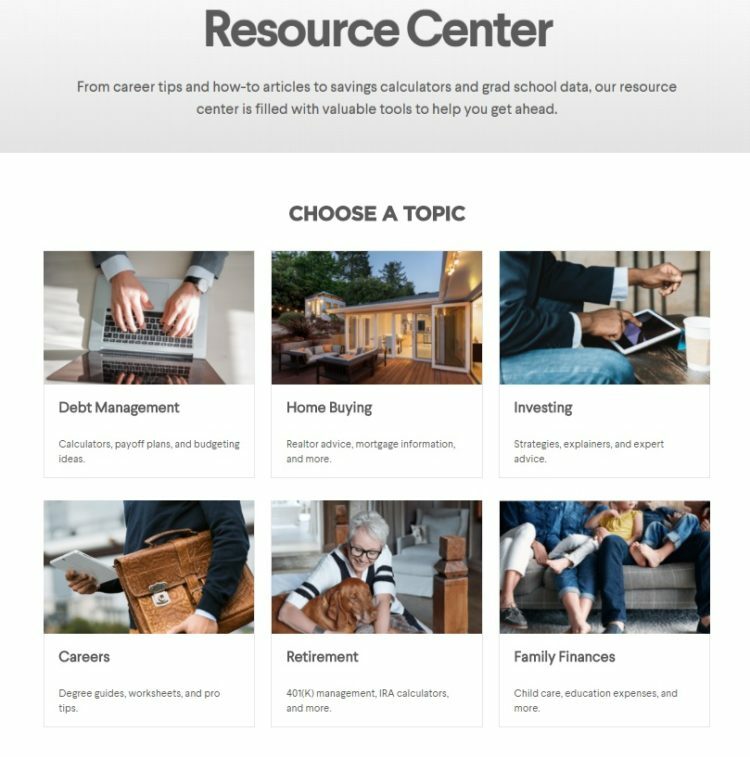 SoFi isn’t limited to calculators, however, as their Resource Center also provides expert advice, explainers and longer-form guides for the more involved user. Case studies and customer testimonials are bottom-of-the-funnel assets that are clearly revenue-driven. In this sense, they need to spur action and hopefully convert prospects into customers. 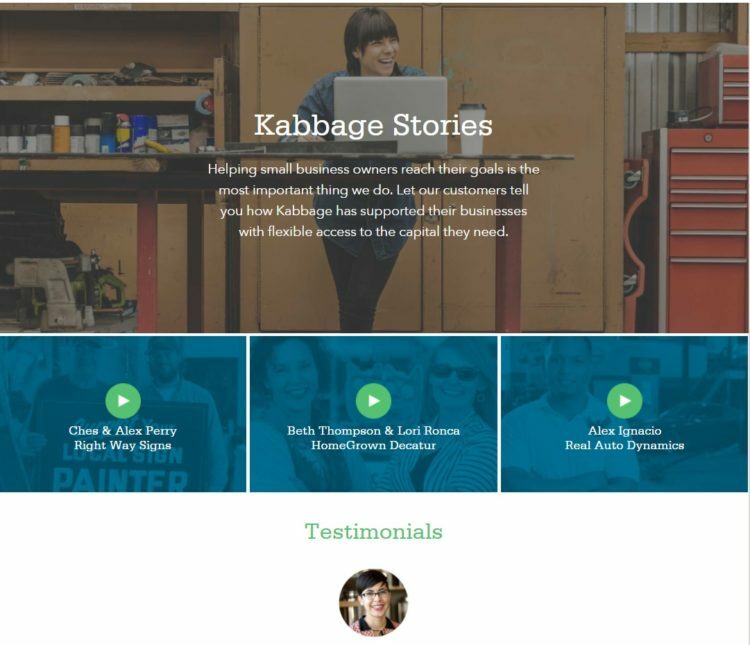 Kabbage, an online financial technology company with an automated platform for small businesses, understands that the more testimonials, the better. Known as “Kabbage Stories,” these tales provide all the reasons for other prospects to come on board. 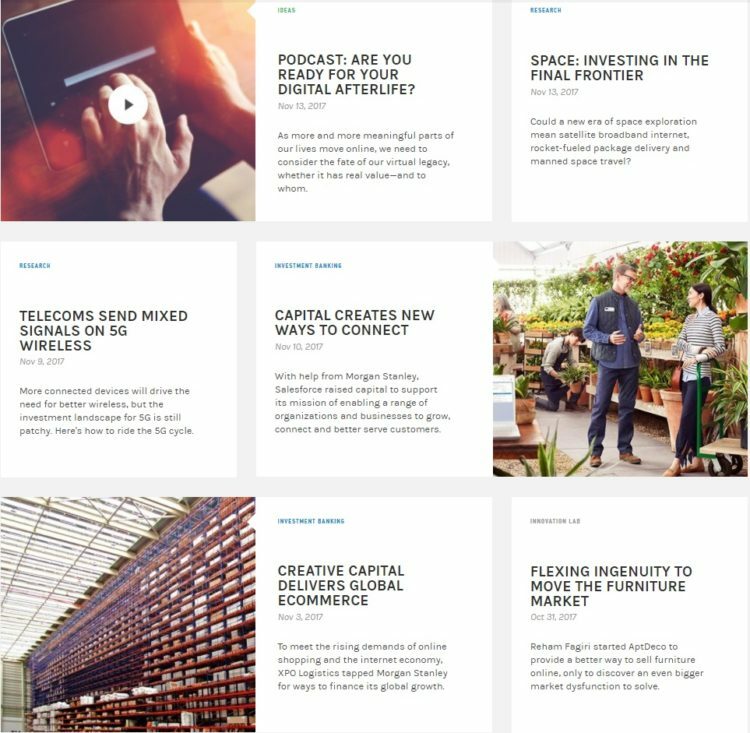 Kabbage features digestible quotes from everyday entrepreneurs and small-business owners, along with pictures and business information right on their Kabbage Stories web page. Clicking on each snippet takes users to a longer case study or a short video testimonial. Kabbage also spotlights user reviews and ratings toward the bottom of the page, showing just how well their services are received. Since high user engagement and strong reviews are becoming more prominent ranking factors in search (especially Local SEO), Kabbage is maximizing their page’s organic value while also providing a UX-friendly resource for sales-ready leads. This nice, polishing touch on their website appropriately pushes prospects through the sales funnel and helps show ROI on their content marketing initiatives. Financial content marketing isn’t all that different from other types of industry-specific marketing ventures. The underlying factor that stands out in the financial space, however, is how demanding and protective customers are relative to other business sectors with which they commonly interact. We all have banking apps, go to ATMs, use direct deposit, invest through platforms and rely on web advice. Of course, money is involved – trillions of dollars of hard-earned money that drives the decisions of financial services prospects. Marketing with intent, authority and, above all, customer trust in mind is a must, and the margin for error is much smaller. Inaccurate web copy could mean regulatory noncompliance, poor user experience could result in unsatisfied customers and ineffective marketing could lead to branding miscues. Using the examples above, what lessons can your brand learn from high-performance financial content marketing? 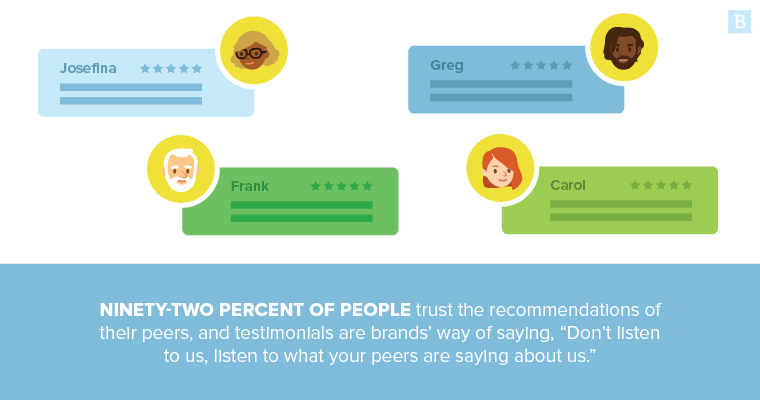 Are you guilty of unethical marketing?